After I wrote The Only Thing Children Really Need Is Freedom, I felt the urge to flip through my copy of The ONE Thing: The Surprisingly Simple Truth Behind Extraordinary Results, by Gary Keller and Jay Papasan. If The ONE Thing offers a sure path to success for people and businesses, I wondered, and if it works in all areas of our lives and on anything as the authors contend, does it also represent a sure path for our children to become successful? And if so, how can we best transmit the lessons of The ONE Thing to the next generation and what signs of The ONE Thing, if any, can we find in our schools today? Could it be that the ONE thing children need is freedom so that they, too, can enjoy the opportunity to pursue their ONE Thing? In The ONE Thing, Keller and Papasan defend that people and businesses achieve extraordinary results when they go as small as possible, they focus on ONE Thing, and they find the answer to this question: "What’s the ONE Thing I can do / such that by doing it / everything else will be easier or unnecessary?" And then they do that ONE Thing, the ONE Thing that matters most. 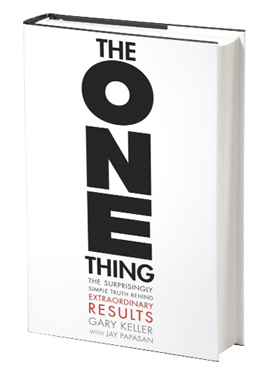 "Extraordinary results," they write, "are directly determined by how narrow you can make your focus." Success leaves clues. People and businesses achieve extraordinary results when they focus on ONE Thing, whether it’s a secret chicken recipe in the case of Colonel Sanders, coffee for Starbucks, or writing books in the case of Gary Keller. The authors also write about the 6 lies or myths that stand between people and their success and those are that Everything Matters Equally, that Multitasking is a "good" thing, that you have to have a Disciplined Life to be successful, that Willpower is On Will-Call, that there is such a thing as a Balanced Life, and that Big is Bad. The message of The ONE Thing is indeed a very simple one: "When you bring purpose to your life, know your priorities, and achieve high productivity on the priority that matters most every day, your life makes sense and the extraordinary becomes possible." X + Y = Life That Makes Sense + Success. And we already know what X and Y stand for. As adults, we take for granted the freedom we have to pursue our ONE Thing if we choose to. Nothing can stop us but ourselves. As adults, we are also free to seek any knowledge we want at any time. If you are reading a book so you can learn to change your own oil and fix your car, which would make trips to the mechanic unnecessary, you probably wouldn’t have the instinct to put it down after an hour in order to read about history for a while so you can have a balanced life. When we make something our ONE Thing, as adults, we do what matters most to achieve success in that thing and when we’re done, we move on to another ONE Thing... of our choice. Children appear to be wired the same way we are in that they naturally and instinctively pursue ONE Thing after another from the moment they are born, and they do so until we, the grown ups, put a stop to it by sending them to "schools." When the child is learning how to talk, his ONE Thing is to make sounds and practice until the sounds that come out also make sense to other people and he can be understood. When the child is learning how to walk, he naturally makes it his ONE Thing to get into a vertical position and put one foot in front of the other until he’s able to walk. Walking makes getting around easier, and talking makes crying unnecessary when the child wants something. Children go through several ONE Things in the first few years of their lives, ONE Thing after the other. When the child enters school, everything changes. All of a sudden, his ONE Thing doesn’t matter anymore or if it does, it matters equally with all the other things. And when the bell rings, it means that his thing won’t matter again until the next day or the next week. What matters most to others becomes his new reality. Everything also becomes harder, required by others, and necessary. Not much seem to make sense anymore and "learning," the child quickly realizes, is a long, boring, and painful process. The natural instinct he had to pursue his ONE Thing slowly fades away. He has to learn to live a disciplined and balanced life because for him, there is no way out. It doesn’t have to be this way. We can give our children lives that make sense by simply not taking away the freedom we have let them enjoy since birth. We can do this by creating school environments such as Sudbury schools where children are given the freedom to pursue their own interests and are given the responsibility to do what matters most to them at all times. When children learn by pursuing their ONE Thing, one thing at a time, instead of being taught all the things others think matter all at the same time, everything else does indeed become easier or unnecessary... for them. Let me give you an example. In Sudbury schools, children are not "taught" how to read and they are not given a time frame by which they have to be able to read. Yet, every single one of them does learn how to read long before he or she graduates. Why? Because somewhere along the way, as the child was pursuing her ONE Thing, the skill of reading became necessary for the exploration to continue. How? For a while, the child made it her ONE Thing to learn how to read so that she could quickly return to the other ONE Thing she was working on. Learning how to read may or may not have been perceived as "hard," but her life never stopped making sense. To her, learning to read was just one more step in the pursuit of her ONE Thing and in the end, it made her life easier. And no, she will not learn "everything" her schoolmates are learning for they, too, are pursuing their ONE Thing. Some learning thereby becomes unnecessary. Children in such environments may go through several ONE Things but that’s the point. Children are not born with tags on their toes telling us what their ONE Thing is and it is for them to figure out, not us. As Keller and Papasan point out, "if you don’t know what your ONE Thing is, your ONE Thing is to find out." That’s every child’s ONE Thing, until she finds out. If we are serious about changing education in this country, we have to start by making it our ONE Thing and then ask ourselves the right focusing question. So what’s the ONE Thing we can do (when it comes to the education of our children) / such that by doing it / everything else will become easier and unnecessary? The answer, to me, is surprisingly simple and clear. The ONE Thing we can do, the ONE Thing we must do for the sake of our children, is give them the freedom to pursue their ONE Thing. Chantal K. Saucier, Ph.D., is a founder of Lafayette Sudbury School in the Lafayette, LA, area and a Realtor with Keller Williams Realty Acadiana. First written appearance of the word 'liberty,' circa 2300 B.C. Le Québécois Libre Promoting individual liberty, free markets and voluntary cooperation since 1998.